The farmers' conflict is costing Argentina 3.4 billion US dollars, approximately 1% of GDP, but production and growth conditions in the country remain intact and are ready to resume in an excellent environment for food producing countries, according to economist Miguel Bein, a former Argentine Deputy Economy minister. Under the title of The perfect storm, Argentina's most recognized political analyst Joaquin Morales Solá describes the country's current political and social situation as dramatic, following a weekend when the government/farmers conflict escalated to new irreconcilable levels. A three-month standoff between Argentina's government and farmers over a tax hike turned violent on Saturday when military police in riot gear used batons to try to clear roadblocks on a main highway. The Argentine farmers' conflict has the River Plate packed with grain bulk carriers waiting to load in Buenos Aires and Rosario (up the river Parana). An estimated 90 vessels are queuing with the tail reaching the access to the port of Montevideo, in neighboring Uruguay. Argentina's food and fuel shortages worsened on Friday as groups of truckers continue to block highways in spite of the government announcement that the stoppage was over following talks with one of several protesting groups. The grain truckers strike in Argentina who are blocking major roads in the country and on Thursday evening confirmed the industrial action are causing major food and fuel shortages in cities forcing cuts on public transport and higher prices in stores. London's prestigious Financial Times has published a scathing report on Argentina's financial situation and the loss of confidence in the current government which it argues has brought the specter of a new default closer. 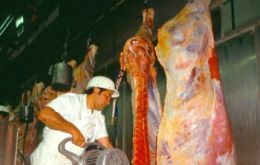 Argentina is unlikely to fulfill its contract to supply the European Union with 28,000 tonnes of boneless top prime cuts of beef, also known as Hilton cuts, according to government and meat industry sources. Argentina's claim over the Malvinas and other South Atlantic islands under British sovereignty was the main purpose of the meeting held on Wednesday between United Nations Secretary General Van Ki-Moon and Argentine Minister of Foreign Affairs Jorge Taiana.